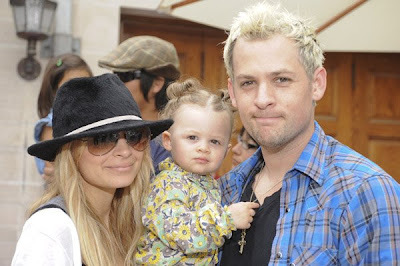 Nicole Richie and family where spotted yesterday (31st May) at the third annual kidstock music and arts festival in Beverly Hills. Nicole Richie kept her outfit simple for the family day out. Nicole Richie wore her $200 Jet thrashed jeans matched with a simple grey 'tee over a black 'tee. Nicole then acessorised with a black and while fedora, Ray Ban aviators and carried her Thomas Wylde 'Ibiza' suede fringed bag. Such a cute family photo of Nicole, Harlow and Joel ..
That last pic( well all) was adorable family pic-soooo cute! !